These are but three of the 23 public presentations that the World Issues Forum at Fairhaven College has presented in weekly lectures open to the university and public over the last year. 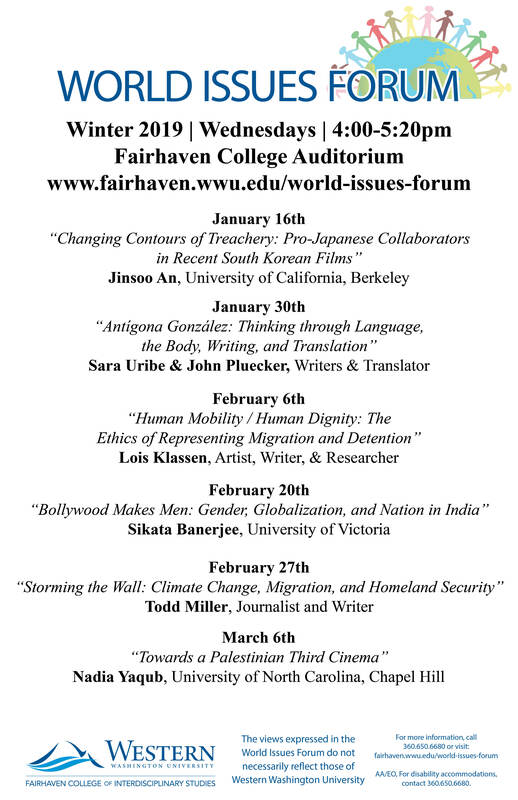 The World Issues Forum is Fairhaven College’s premier speaker series, engaging distinguished scholars and activists from around the region, nation and world on global issues that often fly under the radar of traditional media coverage. As a weekly speaker series, it informs the Western Washington University community (and is the centerpiece to several Fairhaven College courses); it also serves as a conduit for other members of the Bellingham community seeking contemporary and critical viewpoints on global issues. Funding for the World Issues Forum is used to pay for speaker travel and honoraria, as well as the costs of promoting the events to the campus and Bellingham communities. These funds come from student fees, departmental support at WWU and, most importantly, OUR GENEROUS DONORS! Your support will play a crucial role in fully funding this important community dialogue for 2019 and beyond. You are supporting our speaker series as an engaged member of this community! Your generous support pays to feed one of our visiting speakers! You are making a meaningful investment into community learning. You are funding an overnight accommodation for a regional speaker, spreading the reach of our speaker series. By funding a speaker honorarium, you allow us to share perspectives on human rights face-to-face at level unavailable on social media or TV news. Your generosity is exemplary and you validate the work of the faculty and speakers in the World Issues Forum as a key member of our community support network.